Background: Avoidable mortality (AM) is one of the most important health indicators (HI) and represents the quality of care in a hospital. Objective: This study measured the efficacy of a training program for a hospital healthcare staff to reduce AM. Methods: This epidemiological study on community intervention analyzed time-series data on HI by semesters from 2008 to 2015. The pre-intervention phase was examined from January 2008 to December 2014; the intervention phase was investigated in the first semester of 2015; and the post-intervention phase was examined in the second semester of 2015. Results: Resindicate a series with a rising tendency until the 14th semester and a pronounced descent in the 16th semester. The relative variation rate (RVR) was -20% to +20% with some exceptions. HI was 0.53% in the 16th semester rather than the expected 0.70% observed in the pre-intervention phase; therefore, 0.17% additional deaths were avoided because of the training seminar. Conclusion: The positive results suggest that this strategy is an important element in decreasing avoidable deaths in hospitals. Rutstein DD, Berenberg W, Chalmers TC, Child CG, Fishman AP, Perrin EB. Measuring the quality of medical care. A clinical method. N Engl J Med. 1976;294:582-588. Charlton JR, Hartley RM, Silver R, Holland WW. Geographical variation in mortality from conditions amenable to medical intervention in England and Wales. Lancet. 1983;1:691-696. Charlton JR, Velez R. Some international comparisons of mortality amenable to medical intervention. Br Med J (Clin Res Ed). 1986;292(6516):295-301. Holland W. European Community Atlas of Avoidable Death. Oxford: Oxford University Press; 1988. Holland W. Avoidable death as a measure of quality. Qual Assur Health Care. 1991;2:227-233. Benavides FG, Orts R, Perez S. Adding years to life: effect of avoidable mortality on life expectancy at birth. J Epidemiol Community Health. 1992;46:394-395. Gispert R, Torne MD, Arán BM. The efficiency of the Health System in Spain. Gac Sanit. 2006;20 Suppl 1:117-126. Melchor I, Nolasco A, Garcia-Senchermes C, et al. Avoidable mortality. Changes in the new century? Gac Sanit. 2008;22:200-209. doi:10.1157/13123965. EC Working Group on Health Services and “Avoidable Deaths”. European Community Atlas of “Avoidable Death”. 1991. Moauro F, Savio G. Temporal disaggregation using multivariate structural time series models. Econom J. 2005;8(2):214-234. Beck N, Katz JN. What to do (and not to do) with time-series cross-section data. Am Polit Sci Rev. 1995;89(3):634-647. Crighton EJ, Muhammad MM, Ross EG. A population based time series analysis of asthma hospitalisations in Ontario, Canada: 1988 to 2000. BMC Health Serv Res. 2001;1:7. doi:10.1186/1472-6963-1-7. Gisele CM. Pronósticos de mortalidad por enfermedades no transmisibles seleccionadas. Rev Cubana Hig Epidemiol. 2008;46(3). Aibar C, Aranaz J. Can adverse effects related to hospital treatment be avoided? An Sist Sanit Navar. 2003;26(2):195-209. Aranaz JM, Aibar C, Galan A, et al. Health assistance as a risk factor: side effects related to clinical practice. Gac Sanit. 2006;20:41-7. doi: 10.1157/13086025. Kuhn AM, Younberg BJ. The need for risk management to evolve to assure a culture of safety. Qual Saf Health Care. 2002;11:158-62. doi:10.1136/qhc.11.2.158. Otero LM. Errores de medicación y gestión de riesgos. Rev Esp Salud Publica. 2003;77:527-40. Institute of Medicine. To Err Is Human: Building a Safer Health System. Washington DC: National Academy Press; 1999. http://www.csen.com/err.pdf. American Society for Healthcare Risk Management. Strategies and tips for maximizing failure mode and effect analysis in an organization. J Healthc Risk Manag. 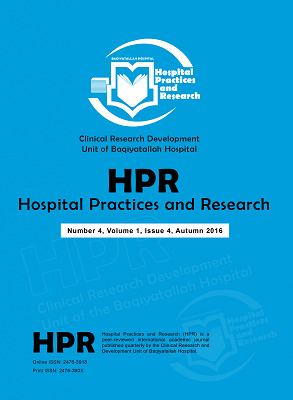 2002;22:9-12. doi:10.1002/jhrm.5600220304. McDonough JE. Proactive hazard analysis and health care policy. New York: Milbank Memorial Fund; 2002. http://www.milbank.org/reports/HazardAnalysis.pdf. Habraken MP, Van der Schaaf TW, Leistikow IP, Reijnders-Thijssen MJ. Prospective risk analysis of health care processes: a systematic evaluation of the use of HFMEA in Dutch health care. Ergonomics. 2009;52:809-819. doi:10.1080/00140130802578563.